March is the last month I can have part time shifts at job, therefore with the 31st of March my "full throttle session" of game deving will end D: Since April I will work 8 hours per day most of the week and this cuts the time I can work on Serenade quite drastically. Touristic season is about to start in Venice and I will have to wait until next winter to have more free time again and still being able to pay the bills ahah. The dev week that has just ended was really short, only five days. I had different plans for it, to be honest. Originally I wanted to complete all the backgrounds for Kujikawa streets. In the end it turned out I used these five days to refine the two I already had soft colored. I wasn't really satisfied with the outcome I was getting so... I decided to give a try with "digital acrylic paint" (well, it's what looks like to me anyway). It's nothing very professional, I warn you. I just used my intuition but I can't wait to find some book to learn properly! 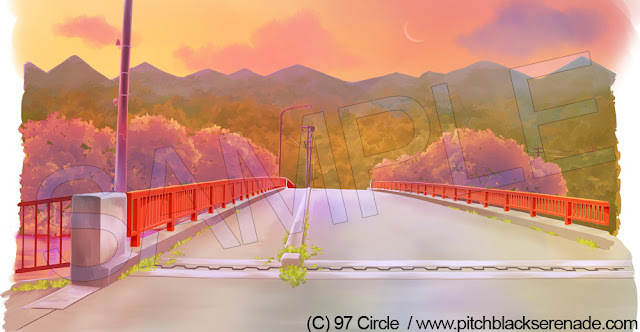 I'm working on Kujikawa at sunset time at the moment and I obviously will need these backgrounds for other times of the day, but I plan to complete the variations later, when working on the next scenes. Therefore, even if I'm completing them to code the third scene of the game as soon as possible, I will reserve some time later to add further details. For example I haven't painted most of the shadows yet. I guess I'll study shadows at sunset a bit before eheh. With this choice of coloring I hope to make indoors and outdoors a bit more closer in style (indoors are made in 3D render, remember? ), I'm still experimenting though ^ ^.